Reading food labels is becoming an increasingly complicated endeavor. Half the ingredients read like a foreign tongue and could make a spelling bee champion’s cranium implode. In truth, most people have no idea what they are eating on a regular basis. If you want to avoid subjecting your baby to meals concocted in some far-off chemistry lab, you may wish to make your own baby food at home. 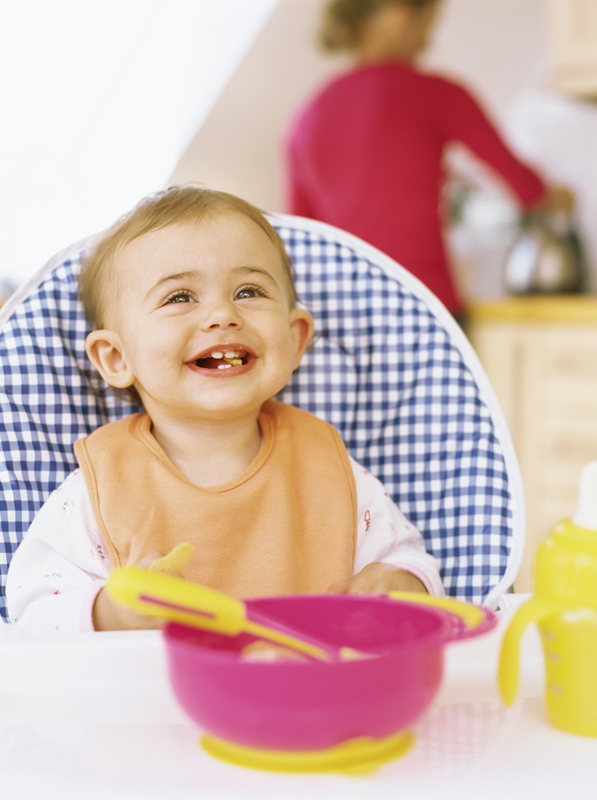 Yes, preparing healthy, additive-free meals for your little one is easier than you may think. As with most things in life, you can opt for an inexpensive, traditional approach or you can splurge for the latest gadgets. The equipment that you need to create homemade baby food are a blender or food processor and something to steam the food in. If you want to add to your collection of handy kitchen devices, you can purchase one of many available all-in-one baby-food-making products. These vary in price and, consequently, the features they offer vary, too. A “top of the line” model will not only steam and puree the foods, but it will also defrost and heat up leftovers. Some great appliances specifically for making baby food include the Baby Bullet Turbo Steamer, the Beaba Babycook, and Dr. Brown’s Puree and Simple Blender. There are many websites that offer you access to free recipes, but you may wish to purchase a cookbook that specializes in epicurean delights for your baby. While you are certainly not limited to this list of produce, some ingredients are easier to work with, lend themselves to a vaster array of recipes and appeal to more little palates. Some great vegetable choices include the perennial favorites carrots, peas, and potatoes. Sweet peppers, sweet potatoes, and avocados are other ideal options for the novice baby food chef. Fruits that work well are bananas, apples, peaches, pears, plums, blueberries, and apricots. Don’t buy produce too far in advance. It’s best to use it within a couple of days of purchase. Frozen fruits and vegetables are a healthy option, too, as they tend to contain less nitrates. Begin by thoroughly washing the produce and removing any seeds, pits, and peels. Steam, bake, or microwave produce that needs to be softened before it can be pureed. Puree the food in a blender or food processor. Some foods may require the addition of breast milk, formula, or water to reach a desirable consistency. Always let baby food cool down sufficiently. If you have used the microwave, make sure that you test for patches of food that are hotter than others. They are famous for heating unevenly. Once baby has eaten his fill, DO NOT store away the uneaten portion on his plate. This must be thrown away. That is why it is important to only put what you think he’ll eat on his plate and top it off if he finishes it. Don’t add sugar to your little one’s food. He doesn’t need it. If you want to make several batches of food at once, go ahead. Most baby foods freeze very well. Here are a few freezing tips. Portions can be divided up into ice cube trays or doled out into dollops on a cookie tray. Either way, ensure that you cover them with plastic wrap or foil. Once they are frozen, you can place the small portions in freezer bags. Another great way of storing them is in an ice cube tray that has a lid. Baby food consisting of fruits or vegetables can remain frozen for up to six months. Your baby’s meals no longer need to be filled with mysterious, multi-syllable ingredients. Creating baby food from scratch, as you can see, is not a complicated, time-consuming task. So look up a few quick and easy recipes and hit your local produce aisle. Your baby will thank you. What are some of the best baby food recipes that you have tried? Kimberley Laws is a freelance writer, avid blogger, and illustrator who thinks a food processor is a marvelous thing. She has written a plethora of articles on a variety of topics ranging from online reputation management to travelling through France via luxury barge.